workshopped and I look forward to seeing it in production in the near future! I recently completed two new books - one on the business of acting and one on auditioning for theater - from a new series I started called Crash Course. They are published by Smith & Kraus, Inc. They should be in bookstores and on Amazon soon! ​Please check them out! I recently directed a play for the graduating 8th grade class at St. Athanasius Middle School in Evanston, IL. 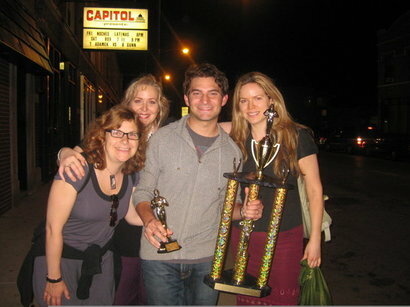 We created the play around the theme of the Oscars, set 10 years in the future at a St. A reunion. The play was performed at Haven Middle School in Evanston. We had song and dance numbers, videos, and lots of scenes. The students did an amazing job! I recently wrote and directed a new short film and had the chance to work alongside one of my talented private acting students. We have an IMDb page coming soon, which you can check out and like, as well as a Facebook page. Please like us! I recently wrote and directed a new short film with three of my talented private acting students. We have an IMDb page which you can check out and like, as well as a Facebook page. Please like us! Grading Curves...on IMDb. Grading Curves...on Facebook. I recently acted in a new short film and had the chance to work alongside the talented Matthew Ellenwood. We had a blast! We have an IMDb page coming soon, which you can check out and like, as well as a Facebook page. Please like us! Who Gets Dad...on IMDb. Who Gets Dad?...on Facebook. Tweet Revenge...on IMDb. Tweet Revenge...on Facebook. I recently taught an Acting in Film course to a small group of private students which culminated in a short independent film shoot.The actors were challenged to apply what they learned in class and they did a great job! This course is limited to 6 students so contact me if you're interested in learning more. An audition is required. We have an IMDb page which you can check out and like, as well as a Facebook page. Please like us! The Survivors...on IMDb. The Survivors...on Facebook. I recently was cast in the short film Deprived, directed by Mike Horky. Here is a still from the film. We have an IMDb page. Please like us! I recently taught a third Acting in Film class with Je Suis Talent in which the students participated in an independent short film shoot! The new film is called Where There's a Will... The actors were challenged to apply what they learned in class to an actual short indie film! The actors did a great job! The next film class and shoot will be starting soon! Class is limited to 6 students so contact me asap if you're interested in learning more! I recently acted in the comic web series 3 Squares which is currently in post production. Here is a still from the shoot. Keep your eyes out for this funny webisode! I acted in the film Mr. Goodman which recently had its premiere screening at the Gene Siskel Film Center. Here is the poster and keep your eyes out for the film. We have an IMDb. Please like us! The feature film Normal, written and directed by Nicholas Richards, which I was cast in, recently had its film premiere at the beautiful AMC movie theater in downtown Chicago. Normal is now in the festival circuit so keep your eyes out for this fun film! Normal has an IMDb page. Please like us! I recently founded The Chicago Female-Focused Film Meetup & Festival. The mission of the group is to create more roles in film for women that break from the restricting Hollywood standards. We recently produced our first film, Meredith's Magic Wand! It was made as part of a 72-hour film contest which really challenged the cast & crew alike! Meredith's Magic Wand has a Facebook page and an IMDb page. Please check them both out and like our pages! Thanks! I was recently cast in the short film The Monkey's Paw. Here is a still from the film. I recently taught a second Acting in Film class with Je Suis Talent in which the students participated in an independent short film shoot! The new film is called Sick Smelly Dirty Politics. The actors were challenged to apply what they learned in class to an actual short indie film! The next film class and shoot will be starting soon! Class is limited to 6 students. The film Spoiled, which I acted in, directed by Carter Martin, is currently entering the festival circuit. Please LIKE the Facebook page and check back for updates. I recently founded a new film group which is focused on creating more roles for all types of women in film, in front of and behind the camera. I recently taught a new exciting film class with Je Suis Talent in which the students participated in an independent short film shoot! The film is called The Sleepover. The actors did a wonderful job and learned so much on set making the film! Special thanks to the guys of Glass City Films and my awesome female crew members! 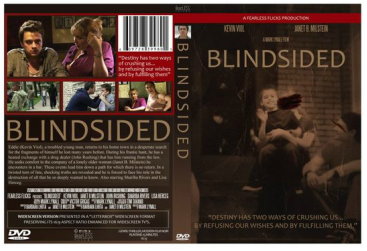 The short film BLINDSIDED now has a website, a Facebook film page , an IMDb Page, a trailer, some cool behind-the-scenes footage, and a cool DVD cover design! Please check them all out and LIKE our Facebook page for updates! I was recently cast in the short film Want and Need, directed by Lila Yanow. Here is a still from the film. I recently was cast in the short film Kickstand, directed by Kenny Savoca. It was an absolute pleasure working with Kenny. He is a wonderful director. Here is a still from the film. I was recently cast in the short film Zero Count, written by Barbara Lhota and directed by Elaine Tuman. Here is a still from the film. It screened at the Portage Theater as 1 of 45 films made in Chicago for the competition.